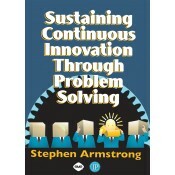 This book demonstrates how Problem Solving and Process Management is at the heart of continuous business transformation. Logically organized in four parts, it introduces the reader to the domains of change and the process management body of knowledge (BOK) and gives detailed instruction on how to creatively re-engineer processes, sustain innovation and continually improve an enterprise through proven repetitive methods. And unlike any book on the subject it offers a practical step-by-step approach that includes the steps, the templates, and the metrics to keep it on track. • Features a tried and tested, practical 17-step “how to” Problem Solving and Process Management methodology that can be used in any business environment. • Includes numerous figures and examples of charts and documents used at each step of the process. • References standard forms, tools, and training materials in the Appendix. • Addresses how to engage the people who are using, creating, and improving the management process. • Explains the steps in creating a process management methodology and presents the process management body of knowledge without the “fad” or spin. • Highlights the importance of good process management to corporate business transformation.